In the conventional approach to the detection of an anthropogenic or other externally forced climate change signal, optimal filters (fingerprints) are used to maximize the ratio of the observed climate change signal to the natural variability noise. 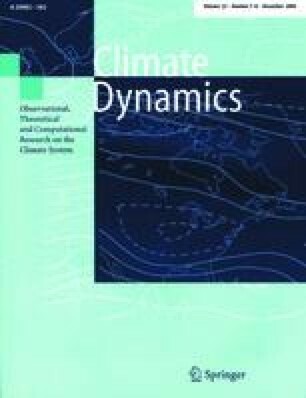 If detection is successful, attribution of the observed climate change to the hypothesized forcing mechanism is carried out in a second step by comparing the observed and predicted climate change signals. In contrast, the Bayesian approach to detection and attribution makes no distinction between detection and attribution. The purpose of filtering in this case is to maximize the impact of the evidence, the observed climate change, on the prior probability that the hypothesis of an anthropogenic origin of the observed signal is true. Whereas in the conventional approach model uncertainties have no direct impact on the definition of the optimal detection fingerprint, in optimal Bayesian filtering they play a central role. The number of patterns retained is governed by the magnitude of the predicted signal relative to the model uncertainties, defined in a pattern space normalized by the natural climate variability. Although this results in some reduction of the original phase space, this is not the primary objective of Bayesian filtering, in contrast to the conventional approach, in which dimensional reduction is a necessary prerequisite for enhancing the signal-to-noise ratio. The Bayesian filtering method is illustrated for two anthropogenic forcing hypotheses: greenhouse gases alone, and a combination of greenhouse gases plus sulfate aerosols. The hypotheses are tested against 31-year trends for near-surface temperature, summer and winter diurnal temperature range, and precipitation. Between six and thirteen response patterns can be retained, as compared with the one or two response patterns normally used in the conventional approach. Strong evidence is found for the detection of an anthropogenic climate change in temperature, with some preference given to the combined forcing hypothesis. Detection of recent anthropogenic trends in diurnal temperature range and precipitation is not successful, but there remains strong net evidence for anthropogenic climate change if all data are considered jointly. This work was supported by the National Oceanic and Atmospheric Administration (NOAA) Climate Change Data and Detection program and the US Department of Energy, Office of Energy Research, as part of the International ad hoc Detection Group effort, and by the European Commission QUARCC project, ENV4-96-0250.